The major network security risks facing small businesses are spam email, viruses, worms, Trojans, spyware, and zero-day attacks. Such attacks lead to not just loss of revenue and lost productivity, but also loss of reputation and possible damaging litigation. Adopting the best solution related to network safety attacks such as collaboration and scalability allow small, medium and enterprise businesses to improve their network security. Is Your Business at Risk of a Hacktivist Attack? Cyber security is of late in the news for all the wrong reasons. Cyber criminals hack businesses and steal confidential information for fun, in retaliation, to prove a point, or to make profit. Hacktivists are responsible for many of the high-profile hacks in the recent past. What do such hacktivists target? Are small businesses at risk from such hacktivists? Whom do they target? How do you keep your small business off their radar? Staminus Communications is proud to present the culmination of ten years of experience in battling DDoS (Distributed Denial of Service) attacks. 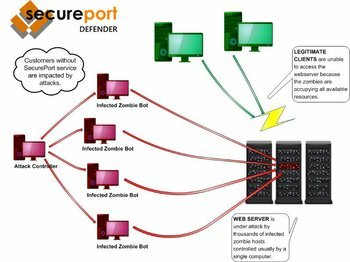 Our SecurePort product is designed in-house from the ground up to provide maximum DDoS protection against all attacks. Get Protected today and secure your website! You can not afford to be down and compromised.